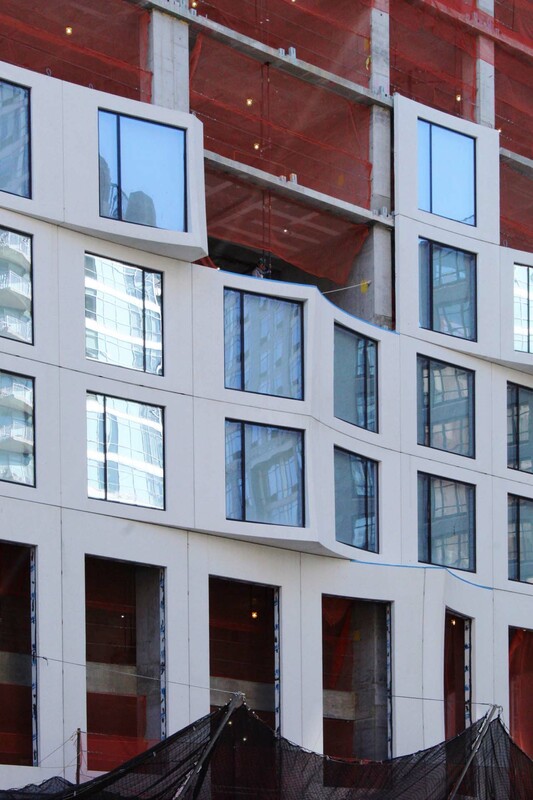 The outer sculptural facade of 11 Hoyt is beginning to ascend up the building, piece by piece. 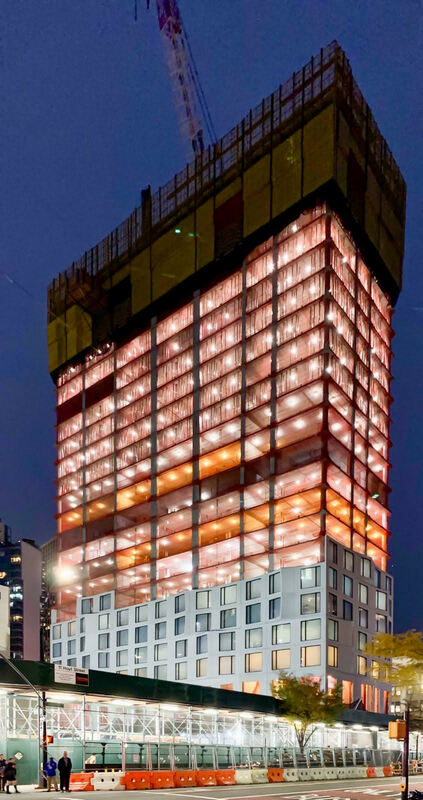 The 57-story, ground-up skyscraper is being designed by Studio Gang Architects, and Tishman Speyer is the developer of the 770,000 square foot project, located in Downtown Brooklyn. 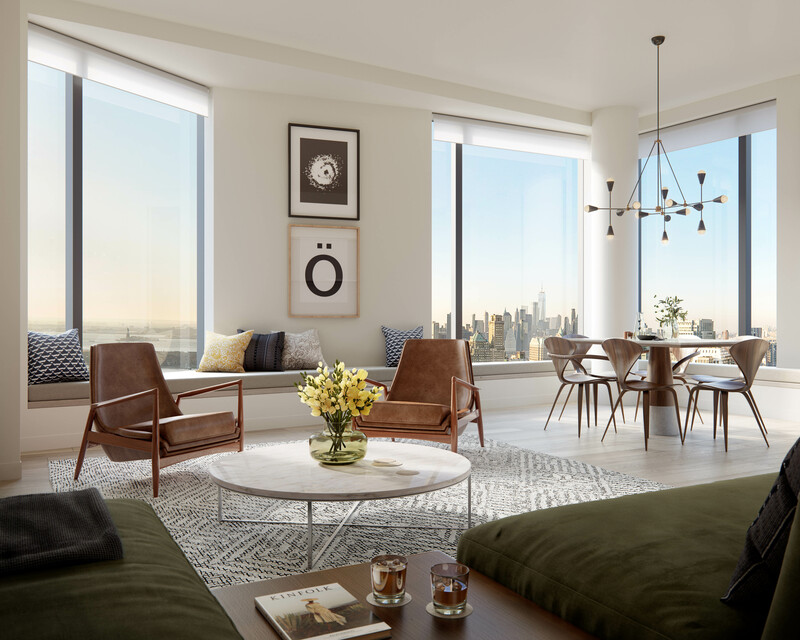 Hill West is the architect of record, while Corcoran Sunshine Marketing Group is managing sales for the 480 condominiums that are being designed by London-based Michaelis Boyd Associates. Individual precast concrete panels are delivered to the staging area on the west side of the site along Hoyt Street. They are assembled in place, are delivered from the inside, and slide into place on each level. From the corners of the building standing along Livingston Street to the south, the sculptural quality is already beginning to show, as different variations of light and shadow bring out and accentuate the sweeping bay window curves that peel away from the skyscraper’s rectangular massing. Refracted and reflected sunlight from neighboring towers shine on the facade, and illuminate the dark corners of the building during the morning hours of the day. 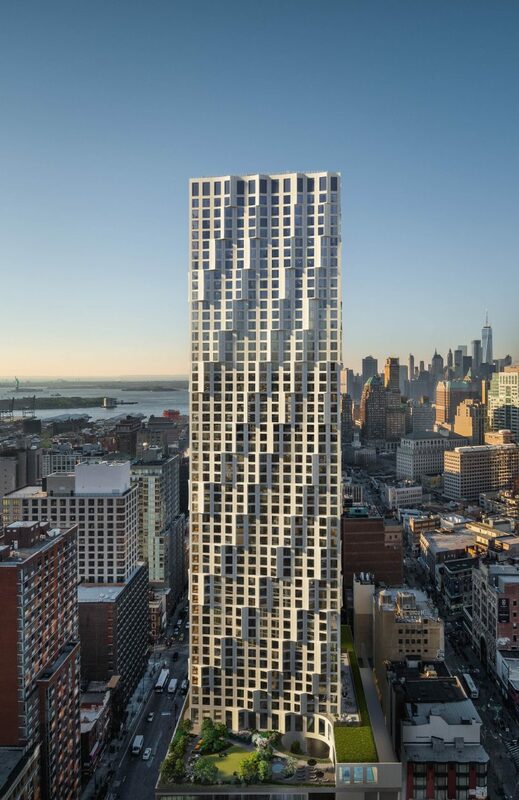 When complete, the entire skin of the building will be uniformly covered with a rippling pattern of large oversized windows optimizing and expanding views across Brooklyn, the Manhattan skyline, and New York Harbor. Vistas will come with perimeter seating along every window of the 480 residential units. 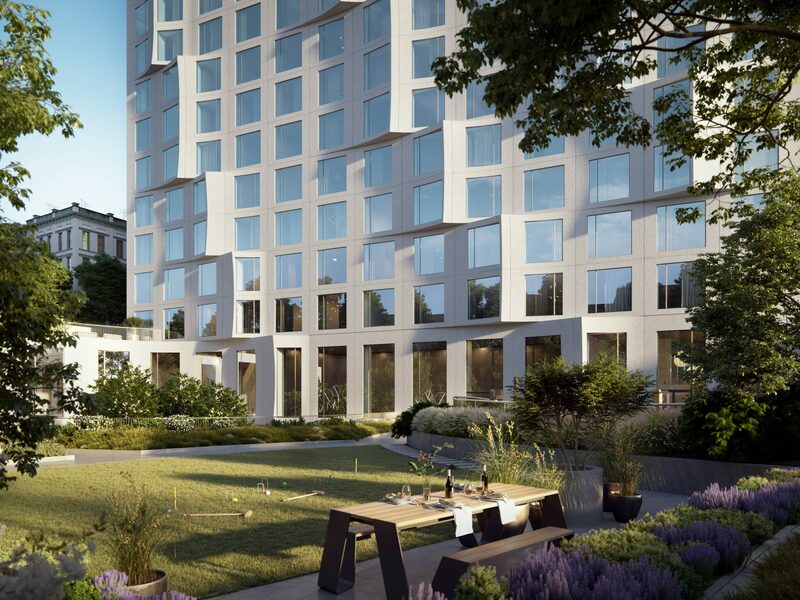 One of the most impressive features about 11 Hoyt is the expansive outdoor elevated private landscaped park to be located on the second floor above the motor courtyard, located on the eastern side of the property. Spanning 27,000 square feet, it is being designed by Edmund Hollander Design and will come with abundant trees and gardens, a sun deck, a children’s play area, lounge spaces, and barbeque pods. 11 Hoyt is expected to be complete in 2020. 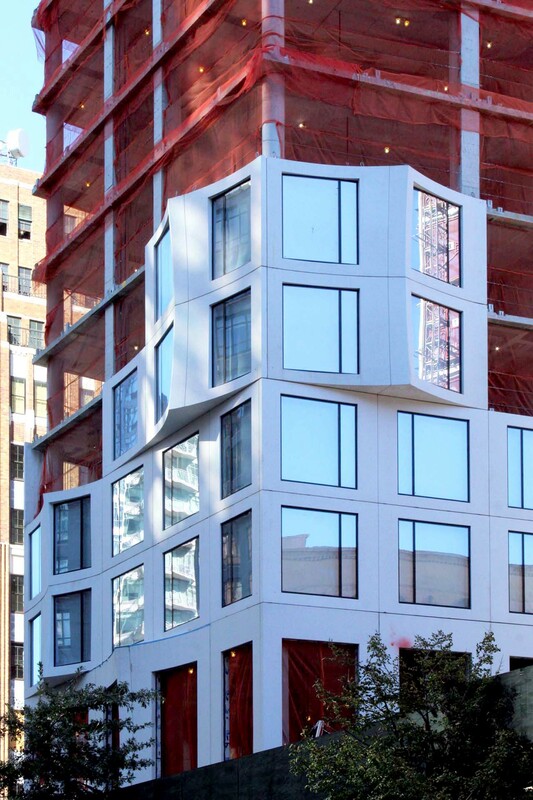 8 Comments on "11 Hoyt’s Sculptural Facade Begins to Show As Superstructure Work Progresses in Downtown Brooklyn"
Please pardon me for using your space: King-sized at the last part, it seems to have no limited on facade. It isn’t Gehry! The architect is Studio Gang, Jeanne Gang’s firm. Both comments are conjecture and as such should stand. How foolish of Tishman Speyer to build condos on this site. There has been 5 shootings in a month in the neighborhood and many more crimes. What fool will pay a million to live there? The area will never be gentrified as developers hoped because the people that hang out there are from public housing projects next door. The building itself is a waste of a great site. There isn’t even a retail base from the renderings. Looks like not a lot of thinking and planning went into this project. Great, so now people who live nearby have to listen to the construction that goes on over there until 4am…. and it’s not like 311 does any good. Despite some of the negative comments here I still consider it a great example of using glass fibre reinforced concrete for facades. That’s an incredible piece of architecture with curved walls.